With large forested urban areas, the city of Edmonton, Alberta, Canada, faces high annual costs of replacing trees injured by deicing salts that are commonly used for winter road maintenance. Ectomycorrhizal fungi form symbiotic associations with tree roots that allow trees to tolerate the detrimental effects of polluted soils. 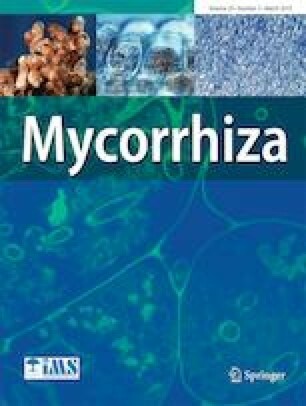 Here, we examined mycorrhizal colonization of Pinus contorta by germinating seeds in soils collected from different locations: (1) two urban areas within the city of Edmonton, and (2) an intact pine forest just outside Edmonton. We then tested the responses of seedlings to 0-, 60-, and 90-mM NaCl. Our results showed lower abundance and diversity of ectomycorrhizal fungi in seedlings colonized with the urban soils compared to those from the pine forest soil. However, when subsequently exposed to NaCl treatments, only seedlings inoculated with one of the urban soils containing fungi from the genera Tuber, Suillus, and Wilcoxina, showed reduced shoot Na accumulation and higher growth rates. Our results indicate that local ectomycorrhizal fungi that are adapted to challenging urban sites may offer a potential suitable source for inoculum for conifer trees designated for plating in polluted urban environments. We gratefully acknowledge research funding from the city of Edmonton, Mr. Tim Ford (city of Edmonton Planning) for his help regarding site descriptions, and Dr. J.Y. Jang for her help with root tips DNA extraction. We also acknowledge Dr. Henryk Kolacz from the Department of Mathematical and Statistical Sciences of the University of Alberta, for his help with statistical analyses. M.C-P. and J.S. performed the experimental work. The study was designed and written by J.J-Z and M.C-P, with contributions from M.A-E, J.K., M.W., and C.S.